Cut down infested firs in winter, when the adelgids remain inactive with their tube-like mouthparts inserted into the bark, to keep the infestation from spreading. Saw logs while still green within the infested forest area, before the spring thaw, and burn the residues on site to eliminate the risk of future contamination. Strip the bark off felled trees before transporting the wood to areas still considered to be uninfested. A quarantine regulation was passed in British Columbia in 1992 (Turnquist and Harris 1993), but a search of the literature provided no information that would allow us to assess the effectiveness of this approach. 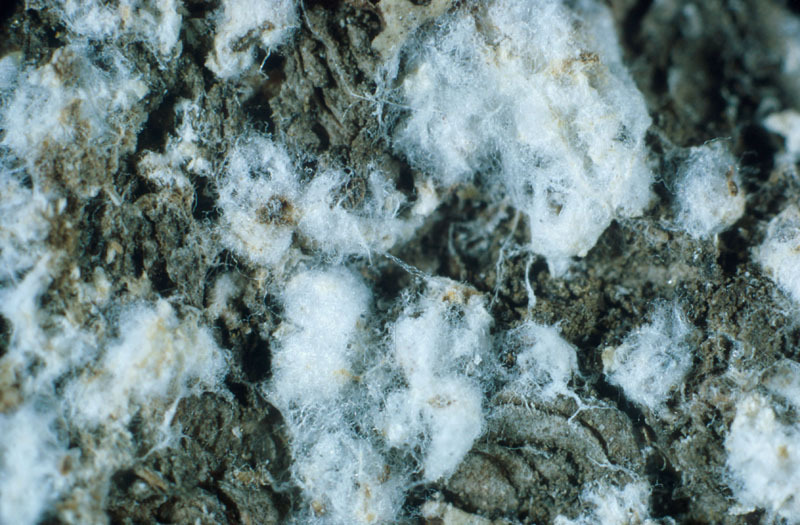 Most stakeholders agree that chemical control over large forested area would be too costly in forests and this strategy is not appropriate since the balsam woolly adelgid remains hidden and inaccessible throughout its life cycle (Martineau 1985, [Anonymous] 2006, Ragenovich and Mitchell 2006, Harris and Bowers 1995). Chemical control can, however, be used for high-value trees such as ornamental trees, Christmas trees and seed production trees (seed orchards), as well as in recreation areas. Contact insecticides (Ragenovich and Mitchell 2006) are effective against the nymphs (crawlers), as are systemic insecticides (Harris and Bowers 1995). The best time for insecticide application varies with the life cycle of the adelgid, and depends more specifically on the time when the crawlers disperse on the stems. 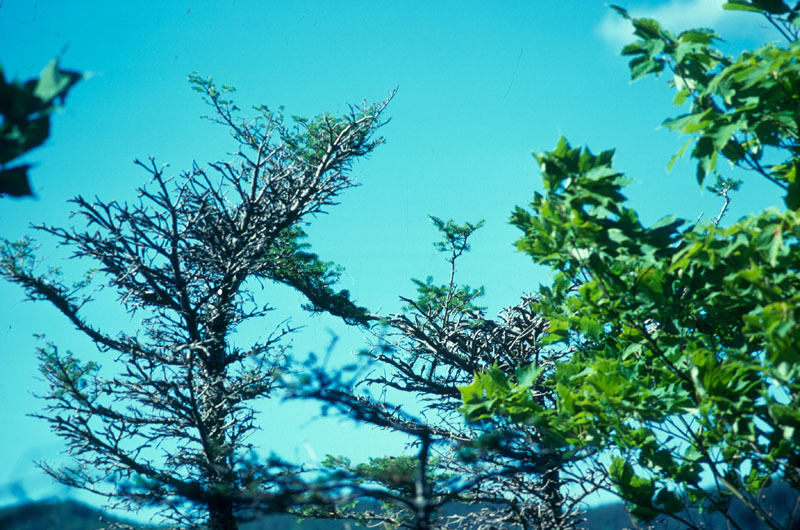 For example, applications are made between mid-June and the first week of July in Newfoundland (Bryant 1976 in Martineau 1985), whereas spraying is done between May and June in the United States (Ragenovich and Mitchell 2006).Insecticidal soaps and dormant oil give good results for individual trees (Ragenovich and Mitchell 2006, Hastings et al. 1986). In the United States, there are reports on the use of Lindane ([Anonymous] 2006) and a fenvalerate/insecticidal soap mixture, which persists longer and does not adversely affect non-target species (Hastings et al. 1986). Spraying nursery stock with insecticidal soap until it runs off, prior to outplanting, is the most promising treatment for nurseries in British Columbia (Harris and Bowers 1995). 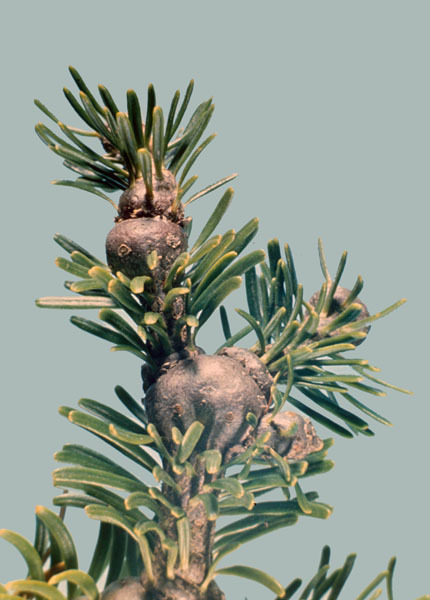 The use of permethrin is recommended by Adam and Ostaff (2006) for infestations of nursery seedlings and Christmas trees and for stem infestations. In Canada, mineral oil is registered against the balsam woolly adelgid. Moreover, other products containing acéphate, diméthoate, endosulfan, malathion, perméthrine, pyrethrines, alone or mixed with other active ingredients, soaps, mixes of carbaryl and malathion, mixes of d-phenothrine and tétraméthrine or d-trans-allethrine and other active ingredients are registered against adelgids on ornamental trees. 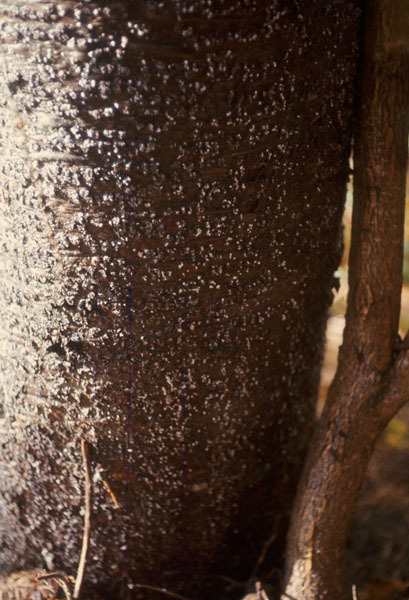 Acetamipride is registered againsts adelgid in ornamental tree culture. In Canada, the balsam woolly adelgid is not limited by any known entomopathogenic parasites, but it is preyed on by many predaceous insect species. Unfortunately, these insects are polyphagous and unreliable as control agents (Adam and Ostaff 2006). With a view to enhancing insect predator activity, 13 predator species were introduced to Canada, between 1933 and 1958, and some of them established here (Martineau 1985). There are 6 insect predators in the United States and Canada, specifically, 3 coleopterans (Laricobius erichsonii, Pullus impexus and Aphidecta obliterate) and 3 dipterans (Aphidoletes thompsoni, Cremifania nigrocellulata and Leucopis obscura) ([Anonymous] 2006, Humble 1994). The list would not be complete without the following: Adalia ronina, Aphidecta obliterata and Pullus impexus (Harris and Bowers 1995).Nonetheless, these insect predators have played an insignificant role in reducing adelgid populations in areas where crown attacks are predominant. Adelgids sometimes fall victim to entomopathogenic fungi (Smirnoff 1970), but so far, the effect has been negligible (Martineau 1985).Winter temperature colder than -20ºC will reduce survival of the insects not protected by a thick layer of snow (Greenbank 1970). Harris and Bowers (1995) have suggested that, in Europe, the natural resistance of trees, rather than the predator complex, is the factor that prevents invasions. Identify forest areas affected by the balsam woolly adelgid, and plan harvest operations for the following winter. Pay special attention to large firs, since they are generally the first to be infested and thus represent the front line for the dissemination of adelgids (Adam and Ostaff 2006). Prevent adelgid dispersal by harvesting trees in winter, sawing and debarking the logs within the harvest area if processing is not planned for the winter, and burning the logging residues on site. Monitor the effects of the winter operations during the following summer and try to detect adelgids in surrounding cutovers. The prognosis is better for high-value trees since chemical control produces effective results (Hastings et al. 1986). As part of a long-term management strategy, replace ornamental trees and Christmas trees (plantations) with non-host tree species, that is, avoid planting first. 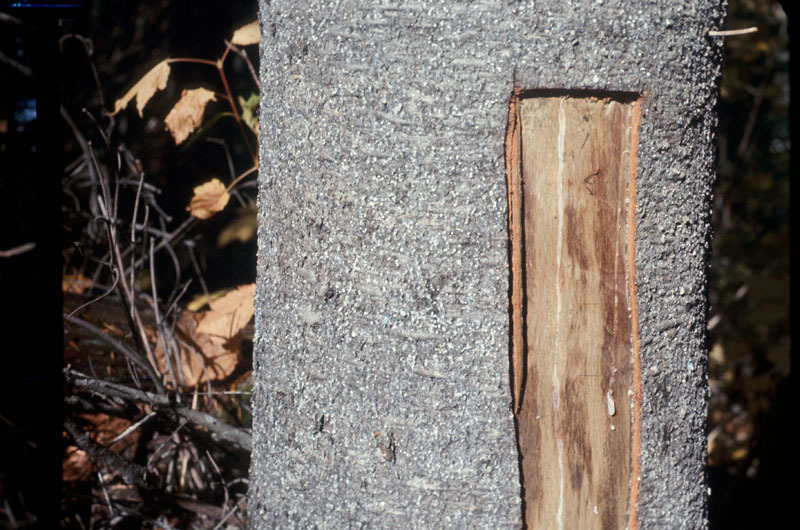 In the spring after a harsh winter in which temperatures between minus 30°C and minus 37°C were recorded, spray insecticides on the part of the trunk that was protected by snow (Adam and Ostaff 2006). Adam, C.I., Ostaff, D.P. 2006. Le puceron lanigère du sapin. Service canadien des forêts, centre de foresterie de l’Atlantique, Fredericton, N.B, Note sur les ravageurs n°3, 2 pp. Greenbank, D. O. 1970. Climate and the ecology of the Balsam woolly aphid. Can. Ent. 102 : 546-78. Martineau, René 1985. Les Insectes nuisibles des forêts de l’est du Canada. Éditions Marcel Broquet Inc., Gouvernement du Canada, Service canadien des forêts et Centre d’édition du gouvernement du Canada, Approvisionnement et Services Canada. 283 pp. Ragenovich, I.R., and. Mitchell, R.G. ; 2006. Balsam woolly adelgid. USDA Forest service, Forest and disease leaflet n° 118. Revised May 2006, 12 pp. Smirnoff, W. A. 1970. 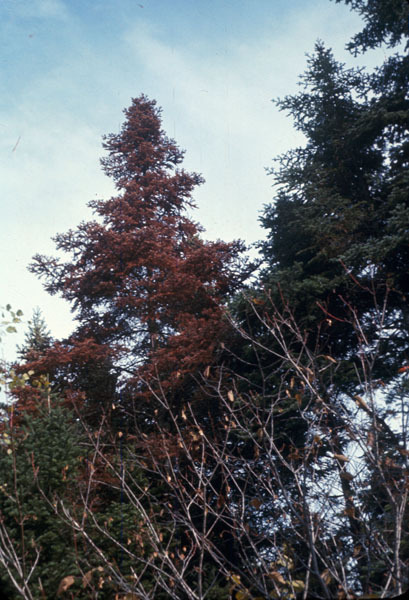 Fungus disease affecting Adelges picea in the fir forest in the Gaspesia Peninsula, Québec. Can. Entomol. 102: 799-805. Turnquist, R. and Harris, J.W.E., 1993. Balsam woolly adelgid. Pacific Forestry Centre. Natural Resources Canada, Canadian forest service, Forest pest leaflet n°1, 4 pp.